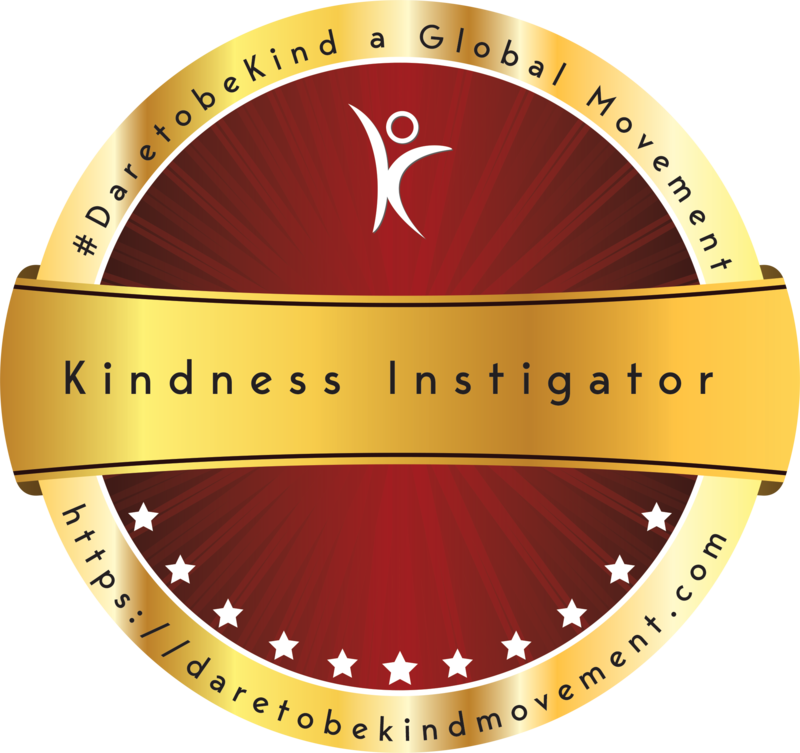 The Kindness Instigator Badge is awarded to individuals and organizations that the #Daretobekind - A Global Movement recognizes as taking purposeful action to improve the lives of others. Be kind to others is their motto. See the need and then meet the need. Create kind moments for others. Go out of their way daily to be kind to someone else. Kindness saved my life. I went through a dark, traumatic experience that took me to the rock bottom of my life. To recover, I came up with a one-year pilgrimage that combined various therapies, including music therapy, kindness therapy, and silly therapy. And the kindness part was what connected me back to humanity, which I had been pulled away from. Don’t be ashamed of your story or where you’ve come from. Kindness should be a natural way of life for all of us. Being kind to others instills in us a positive feeling and makes this world a better place in which to live. I believe kindness is the key to a lot of problems we’re faced with today. Being kind never means you are weak. Kindness is a strength. This is the reason I started NXT FOCUS to help others live their best life, and it’s also the reason I became a Kindness Instigator. I believe kindness is strength and that we must show kindness to ourselves—physically, spiritually, and emotionally—in order to show kindness to others. Kindness begins at home, and when children witness the kindness between parents and experience their parents’ kindness towards them, children are then able to express that kindness to others. It’s my goal to take action and help strengthen others in kindness with kindness. This is why I’ve become a Kindness Instigator. Kindness is love in action. Love is the root of all good. Spreading positivity, like kindness, creates such beautiful energy. We need more progressive, good energy to evolve or become extinct as a human race. We need to re-learn how to value, love and respect one another. We need to surrender and know that teamwork really makes the dream work! We can't do this alone. This is why I join the Dare To Be Kind movement! It doesn't cost anything to be kind. You have nothing to lose but your old self/ego. Time time to evolve is now! We are affected by negativity in many ways, but in general, no one has the energy to deal with it. So let’s see if we can minimize it from the world as much as possible. Please turn off your negative autopilot and develop a kindness toolbox filled with your successes, no matter how small they may seem. (I just turned off mine.) With daily attention to nurturing yourself and dipping into your kindness toolbox, you can slowly build your self-trust and trust that you are doing the best you can at any given moment. D2BK to yourself! As a videographer, it’s my job to make sure people see the deeper message within the footage. For example, messages such as kindness or not judging others. Shining a light on serious matters is important because just like music, i️t helps people figure out what they want or need to feel better. At the end of the day, it’s about helping others, which comes from kindness. My biggest lesson I would like to share is that you define yourself. Once you realize that nobody defines you, that is truly the moment no one can stop you from making a difference. Be kind, be you, and keep moving forward! Humankind is meant to be kind (it’s quite literally in our name). I believe that all humans regardless of age, gender, color, religion, sexual orientation, or any other defining factor that makes them unique, deserve to be loved and treated with kindness. My hope is that this movement inspires you, as it has inspired me, to live every day in kindness. I am passionate about kindness because I can't imagine a world that has no kindness. I believe kindness is the essence of who we truly are. It should be at the heart of every community and flow naturally in endless ripples towards all of life and humankind.